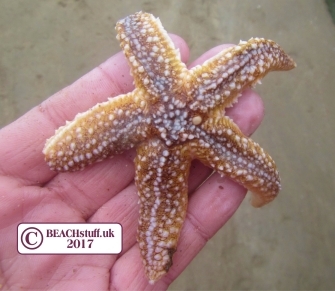 A falsely named group - starfish are not really fish and sea urchins are certainly not Victorian raggedy children. They are in fact both related and are both echinoderms which means 'spiny skin'. They are some of our more exotic-looking marine animals. 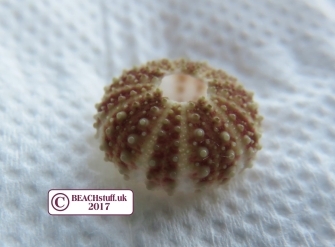 Occasionally, (if you are very lucky), a test (the name for the skeleton) of a sea urchin will wash up intact. Although, a fragment like that below is probably a more realistic goal. 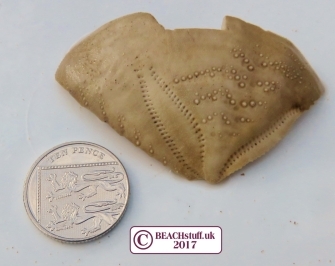 The urchins themselves (bottom left) live on rocky sea beds and can grow up to 10cm across. They eat seaweeds, algae and barnacles. 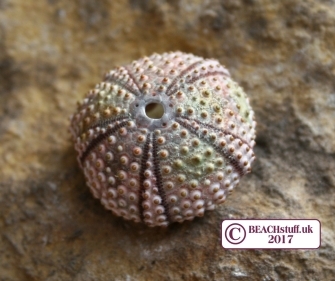 Urchin is an old word for hedgehog and it is easy to see why sea urchins were thought of as a type of sea hedgehog. This little one was tiny - less than a centimetre across but still had its spines attached (below left). 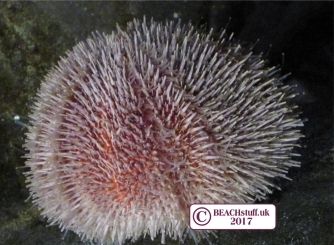 They tend to be flatter than the common urchin with realtively longer spines, although live in the same sorts of places and have a similar diet. 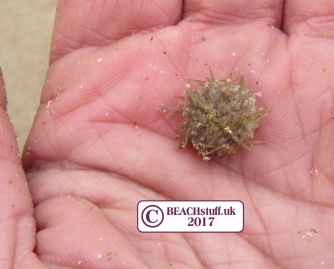 The sea potato, or heart urchin, is an urchin which lives buried in the sand. 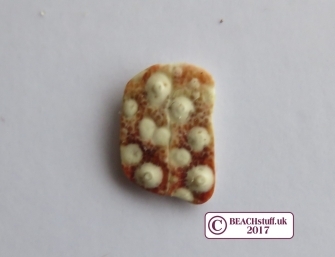 The tests often wash up on beaches, sometimes with a few of the spines (see left) that would, in life, have covered its little round body. They are generally between three and five centimetres across. 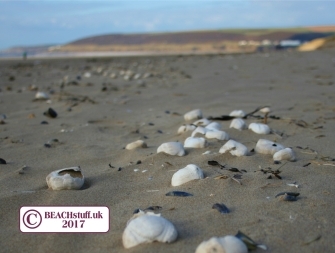 When you find them, don't pop them in your pocket, because when you get home you will just have a handful of pieces of shell - they are very fragile. And they can sometimes smell a bit too. If you are so incllined, you can clean them by soaking them in water with a small amount of bleach overnight. Rinse (oh so carefully as now it is even more brittle) and, when dry, coat with diluted white glue. This is intended to make it a little less fragile. I hang mine on cotton until the glue is dry. The finished product is beautiful (see left) although it is hard to know quite what to do with them then as they remain so fragile. Any ideas would be very gratefully received! 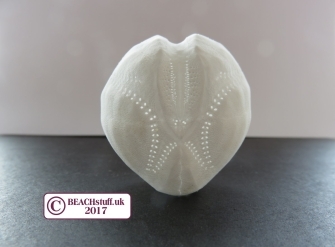 Sand dollars are the tests (skeletons) of flattish urchins. 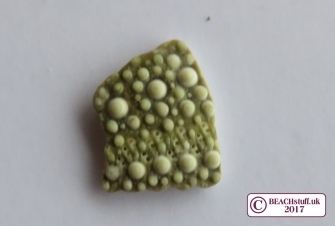 The ones on the left are from Pea Urchins and are just a few millimetres wide. 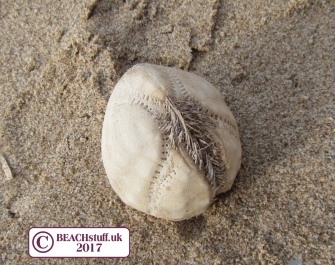 Occasionally, tantalising pieces of much larger sand dollars wash up like this one below left. 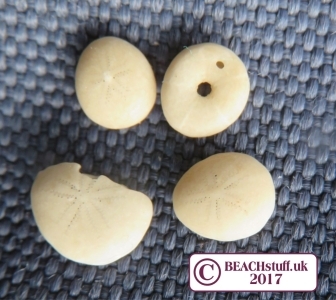 They all have this star shape in common (as do the sea potatoes above) which can be seen really clearly in this one below that I found in exotic parts. 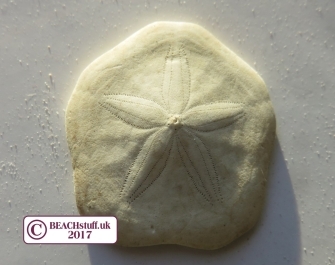 The starfish is not a fish at all, but closely related to sea urchins, And it is easy to see that they have the star shape in common with sand dollars. Starfish love nothing more than to eat a sea urchin which just goes to show that the concept of family means nothing to some. 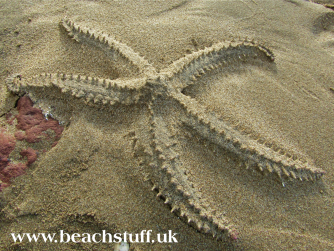 Sometimes starfish wash up stil alive, it is worth popping them in the water just in case. 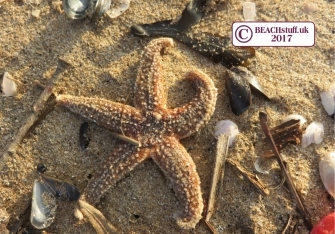 For more on starfish, particularly starfish in rockpools, have a look at this page. This is our largest starfish and generally much larger than the common starfish (above). It is often bluish/greenish but is most distinguishable by the distinct lines of spines along its legs. 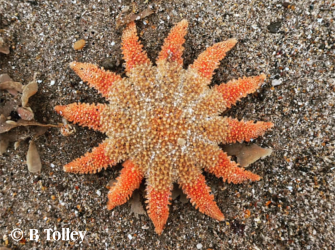 The sunstar has relatively short arms relative to the size of its body and around 10 or 12 of them. It is generally orange which really helps it to live up to its 'sun' name.